Q: US leaders have said on many occasions that the US has run a huge deficit with China over the past two decades and gifted China an immense amount of wealth, which is like the US helping "rebuild" China. What's your comment? A: Their words sound like the US is claiming credit for China's development achievements, which is not only untrue but also illogical. First, fundamentally speaking, one country has to rely on itself to realize development. 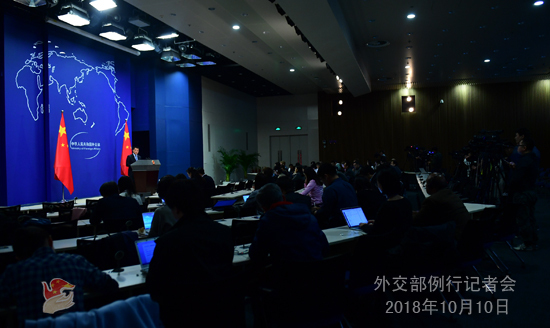 China has made remarkable development achievements because we have the right leadership of the Communist Party of China and the path of socialism with Chinese characteristics, because China is committed to deepening comprehensive reform and opening-up, and because we Chinese people are hardworking and full of wisdom. That said, it doesn't mean that we mind our own business with doors closed. Instead, what we have been doing is seeking mutually beneficial and win-win cooperation with others with doors wide open. A country with nearly 1.4 billion people cannot be expected to grow up and grow strong on others' almsgiving and charity. Besides, I'm afraid no country has what it takes to "rebuild" China! Second, the US trade deficit with China is a result of multiple objective factors. The white paper titled the Facts and China's Position on China-US Trade Friction issued in September explained that in detail. To sum up, that deficit is caused by the comparative strengths of the two countries and the international division of labor, something American economists have already concluded long ago. China has been conducting its foreign trade in compliance with market rules and in a fair manner. With China, the US does more imports than exports. Besides, it chooses to restrict its exports of high value-added goods to China which has been going on for a long time. All these naturally give birth to deficits. Therefore, it is not fair and reasonable to blame China on the deficit issue. Third, the China-US bilateral trade is by no means the so-called "one-way street" where wealth only goes from the US to China. Over the years, the US has benefited extensively and enormously from economic cooperation and trade with China. As estimated by the US-China Business Council, US trade with China has helped each American family save an average of 850 dollars each year. According to statistics from the Chinese Ministry of Commerce, the sales revenue of US businesses in China reached around $606.8 billion in 2016, with a profit of over $39 billion. The research report published by the Deutsche Bank in June said that the US has in fact realized more net profits for their businesses through bilateral trade with China than China has. All these statistics and analyses demonstrate that the China-US trade and economic cooperation is mutually beneficial in its essence. No one would like to do a loss-making deal, let alone do that continuously for over 20 years. 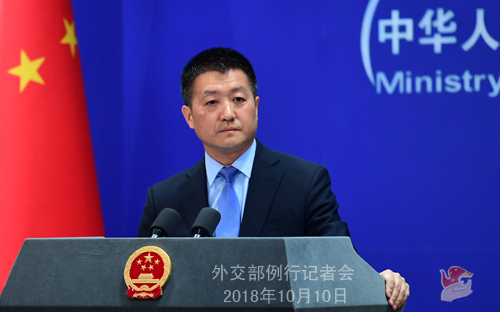 We urge the US to adjust its attitude and respect facts, stop its unfounded accusations against China, adopt a correct perspective on China and China-US trade ties, and do more to serve the business communities and consumers on the two sides. Q: According to reports, Chinese Vice Foreign Minister Kong Xuanyou, Russian Deputy Foreign Minister Igor Morgulov and DPRK Vice Foreign Minister Choe Son Hui recently met in Moscow to discuss the situation on the Korean Peninsula. Do you have more details? What consensus has been reached by the three parties? A: On October 9, Vice Foreign Minister Kong Xuanyou, Russian Deputy Foreign Minister Igor Morgulov and DPRK Vice Foreign Minister Choe Son Hui held a dialogue on the Korean Peninsula issue in Moscow. The message from this dialogue, as far as I know, is that the Korean Peninsula issue should be resolved in a peaceful way through political and diplomatic means. The three parties welcomed the recent positive changes on the Korean Peninsula and expressed support to the continuous progress in the DPRK-US talks, sustained improvement of inter-Korean relations and the efforts by relevant parties to promote the political settlement process of the Peninsula issue. The three parties agreed that it is imperative to advance in a balanced way the denuclearization of the Peninsula and the establishment of a peace mechanism on the Peninsula. Relevant parties should maintain the momentum for dialogue, take corresponding measures to meet each other halfway, continuously promote progress in the peace talks on the Peninsula, and realize long- lasting peace of the Peninsula and the region at an early date. Q: The US leader reportedly said yesterday that if China continues to retaliate, the US will bring in the latest round of tariffs on $267 billion worth of Chinese imports. What is your comment? A: You might have heard a lot of times the Chinese government's position on this issue. Our position remains unchanged. I can repeat it for you if you need it. Like I just said, trade and economic cooperation between the two sides is in nature mutually beneficial. We don't believe that escalating trade frictions or even fighting a trade war is in any side's interest or bodes well for the global economy. Meanwhile, China is resolutely determined to safeguard its own interests. No one shall entertain any illusion about this. Q: On October 9, US President Trump announced that he has accepted Nikki Haley's resignation as UN Ambassador, and will probably name a successor in two or three weeks. How does China look at Haley's work and cooperation with the Chinese side as US Ambassador to the United Nations? What are China's expectations for China-US multilateral cooperation under the UN framework? A: Ambassador Nikki Haley has engaged in dialogue and cooperation with the Chinese side on many issues while working at the UN. As permanent members of the Security Council, China and the US share the important responsibility in upholding world peace and security. The Chinese side stands ready to continue communicating and cooperating with the US side under the UN framework.